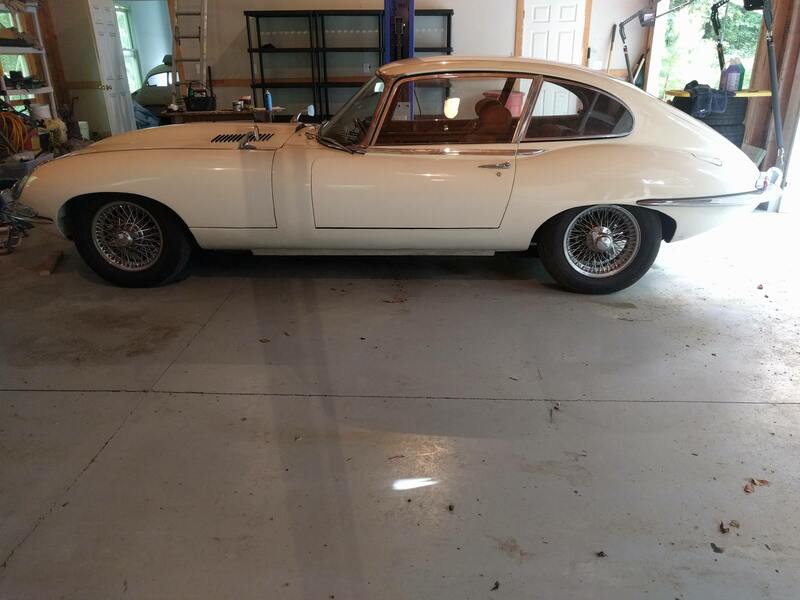 As discussed here, I have decided to perform a refresh on my 1967 E-Type 2+2. The goal is to allow the car to be competitive in JCNA concour events. 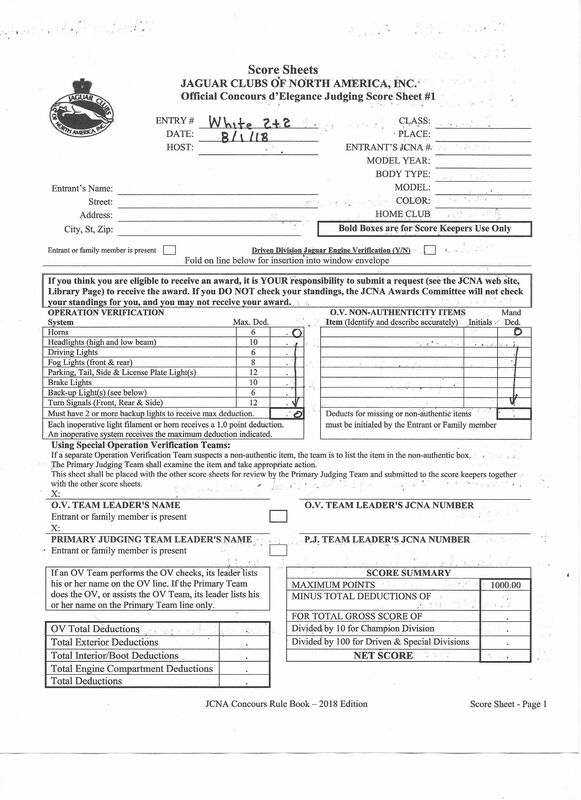 I have been a certified judge for JCNA judge for a number of years. I decided to evaluate this car in detail, using the standards applied in all JCNA concours events. Spoiler alert: this car, as-is, would not be a contender for top honors! There are two general categories in which this car could be shown: Driven and Champion. Champion is the more stringent category, with the main difference being that the engine compartment is judged in Champion. 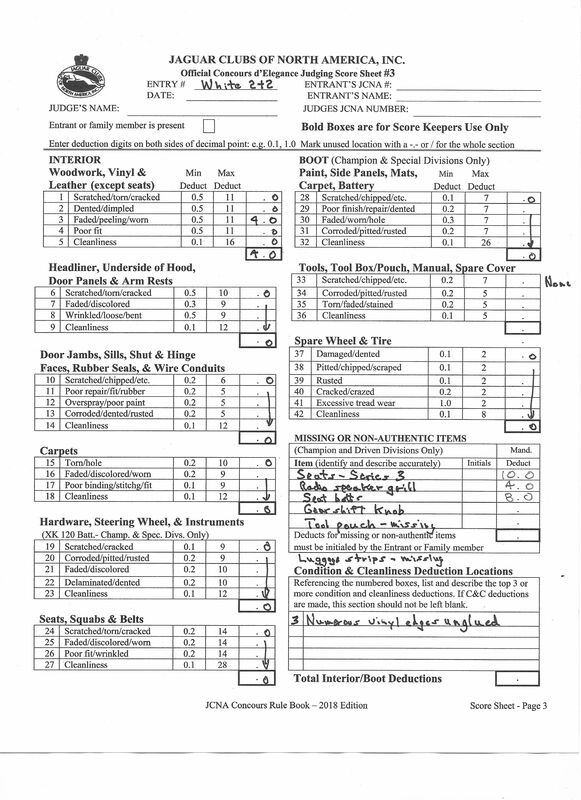 I printed out a set of JCNA “Official Concours d’Elegance Judging Score Sheets” (4 pages) and proceeded with my evaluation. 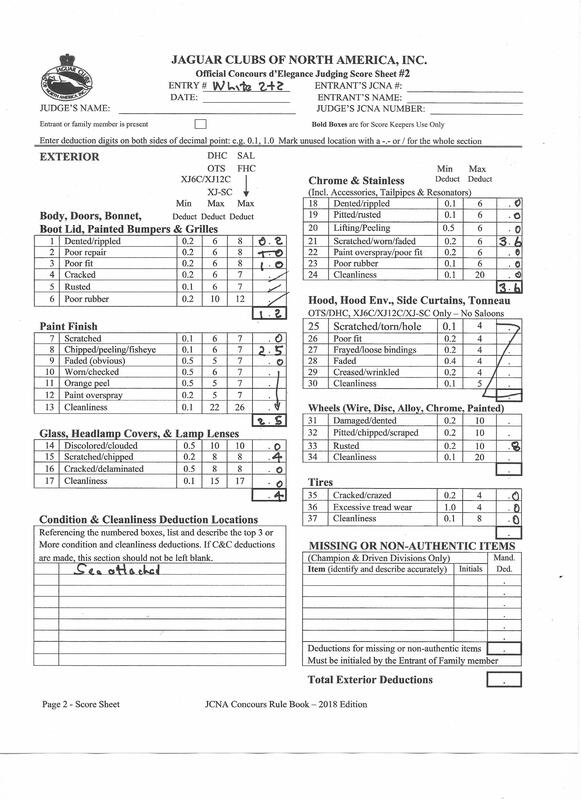 The 4 sheets are Exterior, Interior, Engine Compartment, , and Operation Verification (which also serves as the Summary Score sheet). 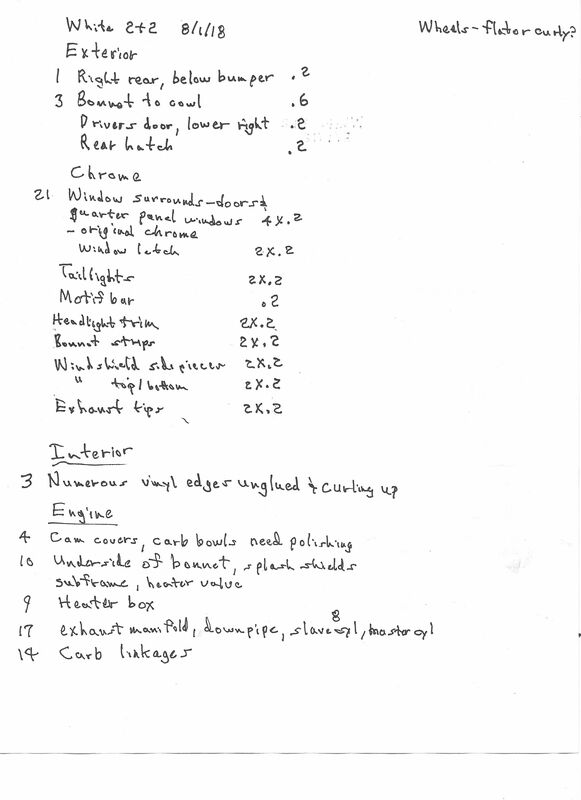 Unfortunately, the list of non-authentic items in the engine compartment is lengthy. For Driven Class no harm/no foul but these would be an issue in Championship: Radiator, fan, alternator, wiring, voltage regulator, distributor, spark plug wires, wire loom, hoses, coil, resistor, windshield washer, hose clamps, battery hold down. 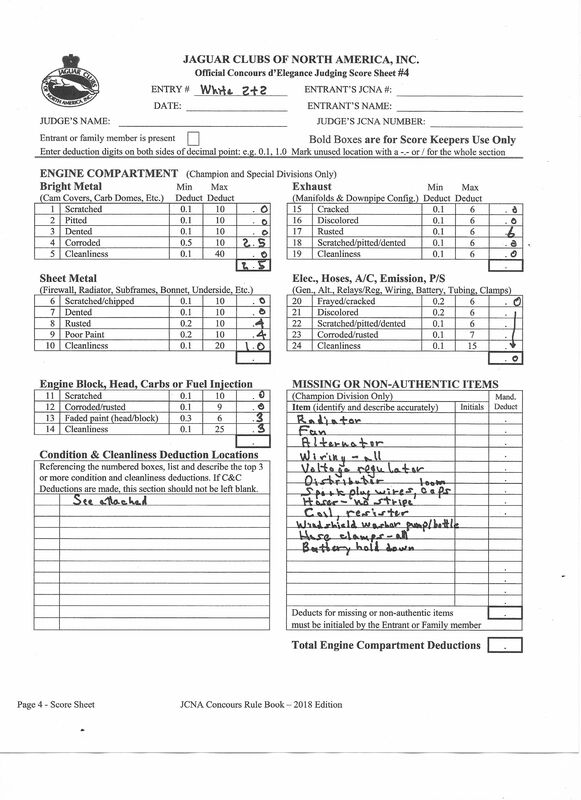 Operation Verification – No issues were found in this category! The good news is that I have a pretty solid list of items for improvement. Because of the long list of non-authentic items in the engine compartment, the path of least resistance would be to prepare the car for Driven Class competition. That said, a good cleaning and detailing of the engine compartment would do wonders and just involves sweat equity. I definitely think I will get the engine compartment looking very nice and replace some of the obvious non-authentic components. But not the CoolCat radiator and fan. They are what have resulted in this car running cool and calm in all manner of driving conditions. I marked all the paint blems on the car with a marker. Unfortunately, no panel was spared. The nature of basecoat/clearcoat paint is that the entire panel must be resprayed if any portion of the panel undergoes paint repair. So it looks like the first order of business is to look at a total paint re-spray of the entire car. Not to bare metal mind you, as the paint job is sound. But I will sand down the entire car, fix/repair all blems, and come back with a sealer coat, a color coat, and a clear coat, followed by finish sanding and buffing to a show car finish!